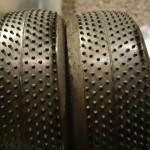 So my first blog in the new category where I will share some of the hints tips and tricks that I pick up from watching and speaking with the more experienced RC racers at meetings I go to. 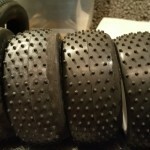 All the tips that I will share are specific to Short Course Racing on Astroturf unless otherwise mentioned and 4wd in particular as I will be testing them all out on the mighty Tekno. 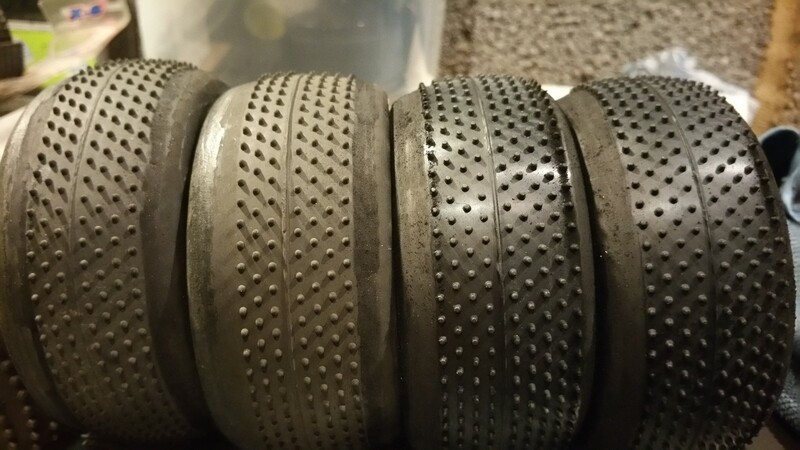 So for the first year of racing I never once messed around with the standard make up of any of the tyres I used instead opting to just mix and match pairs to get the desired level of grip. However last year at one of the rounds I spotted a driver running some rather weird looking tyres on the front of his 4wd Short Course Truck. 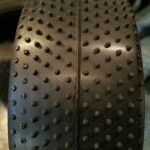 Very smooth and shiny sidewalls which appeared to reach up and over the shoulder of the tyre and onto the top. 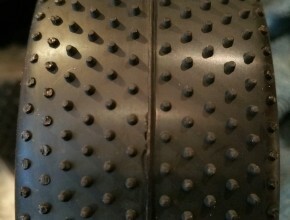 What he had done is remove the first 2 rows of pins from the outer edge of the tyres to reduce the side bite and thus reduce the tendency to grip roll on the corners. Naturally in my quest to go ever faster I soon set out to have a go at this tyre tuning malarky to see if it could find me some time. I got myself a brand new pair of Schumacher Mini Pins in blue compound (the dont wear out as quick on the trucks and you don’t want the extra grip of the softer yellow compound). 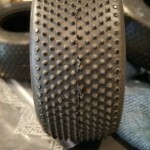 I firstly cut off the outer row of pins with some side cutters before getting the trusty dremel out to smooth them off. DONT JUST LEAVE THEM AFTER CUTTING THEM OFF WITH THE SIDE CUTTERS as this really doesn’t help with lowering the side bite, if anything it makes it worse as the base of the pin once cut has a larger surface area and wont make a noticeable difference, trust me I know as I did this thinking I could save time by skipping the dremel stage. 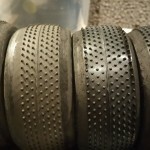 I only did one row to start with and the difference was good enough to go a whole second a lap faster at my local indoor astro track, I went one stage further as our local track is very high bite and took off another outer row, and again more time was found, about another half second. The science here is simple, less pins to dig into the astro therefore reducing the risk of grip roll allowing you to push the car harder into the corners and get on back on the throttle earlier. The high gravity centre of the short course trucks makes the notoriously tricky to drive fast and grip is the enemy in most cases on most tracks. The first round of the nationals this year at ARC where the grip is high as are the cambers and hills, tyre tuning is critical to get the pace needed to run at the front. 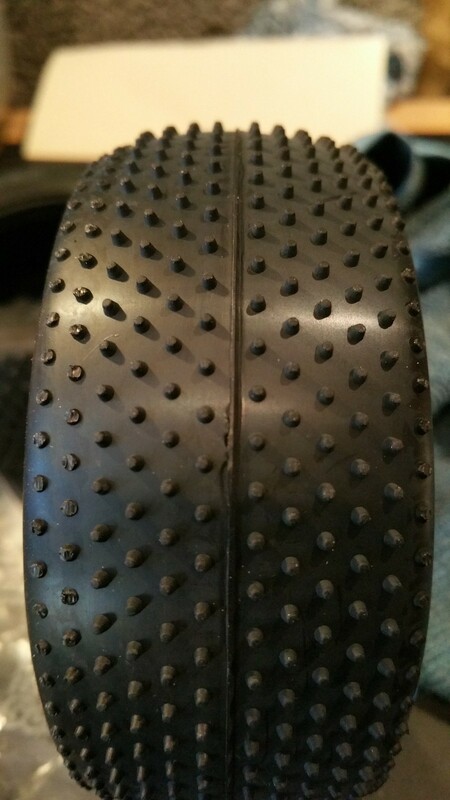 I arrived with mini pins with 2 outer rows trimmed and smoothed and the truck was fast, but still a little too edgy and threatened to topple over at any moment, I stuck with it as I was nervous that taking too much off the tyre it could quickly go the other way…….If you take too many off you cant put them back on? Following the first round I decided more trimming would be needed. The winning driver from round 1 absolutely dominated with the TEKNO SCT410.3 on trimmed and smoothed Mini-pins only his tuning was way more aggressive! 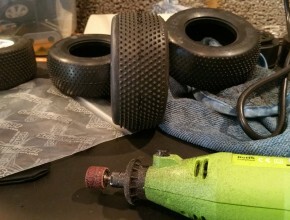 On the basis of what I learned above I have now got a few pairs of tyres all with slightly different configurations so I can quickly swap the tuned tyres to test out which combination provides the required grip levels to get the hammer down on any given track surface. 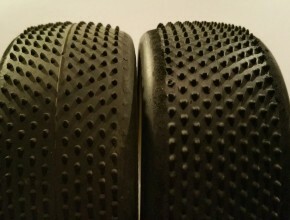 Also worth noting that different tyres have different shapes which affect the amount of side bite they generate, for example the mini pin has a rounded shoulder with pins all the way to the edge, pinpoints have a less rounded shoulder and the pins start a little further up so there is less side bite on these ones as standard which also means you do not need to remove as many rows to get the desired grip levels. 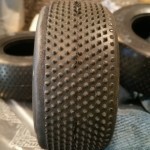 Kourse Kings are almost square on the shoulder and are the lowest bite tyre of the bunch I have used so be cautious if you set about dremeling pins of your last pair of kourse kings? 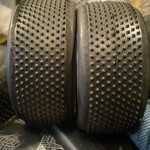 Usually these are OK as they are once worn in but the sweet spot is narrow so bed them in and keep them in your box for when all else fails!! 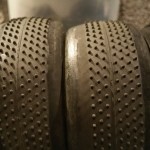 Wash the tyre to remove all the rubber dust in warm water, I have heard using WD40 can soften old tyres and make them usable again? 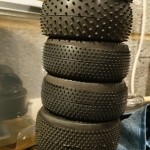 I have not tried this yet as I also heard it can give you more grip and the purpose of this excerise in Short Course racing is to get rid of some of the grip? 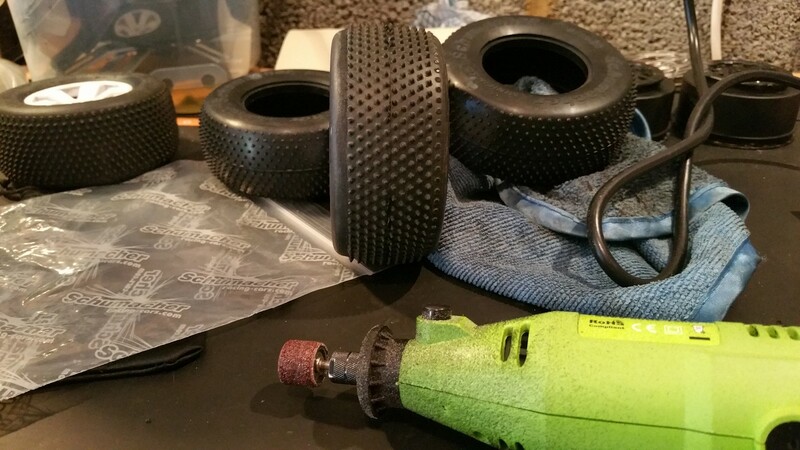 Mount the tyres with your desired inserts. GO TESTING!! None of these techniques are new, the 8th rallycross guys have been doing this for years however I would say its a relatively recent tuning option in the UK scene for short course racing, as the trucks are increasingly starting to resemble 8th scale buggies underneath the scale looking bodies this technique is all the more relevant. Mini Pins, yellow left with 3 out 2 in removed, blue right with 2 out 1 in removed. A set for every occasion, hopefully!! 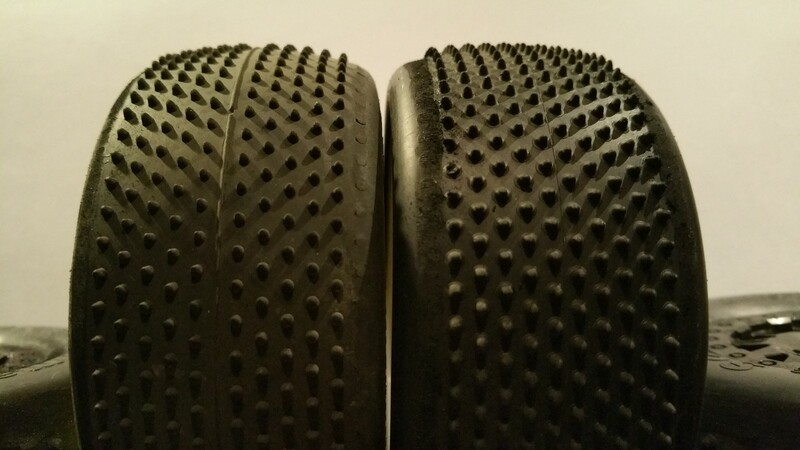 Getting ready to run on a new turf track that is having their grand opening this weekend, so I just sanded off the 2 outer rows of pins on the fronts of my SC tires, thanks for the tips! Where is this track at ?